FANS 1/A+, CPDLC DCL, ATN B1, ADS-B, ADS-C.
Aircraft buyers and owners, are you prepared? To further advance the safety and capacity of the Air Traffic Control (ATC) system the modern world has embarked on an upgrade. With this in mind it is essential to examine a portion of the worlds airspace. The airspace in the North Atlantic (NAT), which links Europe and North America, is the busiest oceanic airspace in the world. In 2012 approximately 460,000 flights crossed the North Atlantic and that volume of traffic continues to increase. To accommodate this growth aircraft equipment requirements have been mandated to increase the accuracy and redundancy of navigation and communications. Since the 1990’s both Minimum Navigation Performance Specifications (MNPS) and Reduced Vertical Separation Minimums (RVSM) were instituted to increase the capacity of both NAT and domestic airspace. To provide an efficient flow of traffic from North America to Europe and vice versa a North Atlantic Organized Track System (NAT OTS) was developed to take advantage of optimal winds over the region. This track system has become the basis for expanding aircraft equipage requirements. Those with the best equipment will enjoy the most efficient routing. The concept of “data link” has been around since the 1980’s and has developed as technology has increased. Airlines have used a form of data link over the North Atlantic Region for over 30 years using ACARS (Aircraft Communications Addressing and Reporting System). Other operators in this airspace have relied upon HF (High Frequency) radio communications for both communication and position reporting. HF at best is poor quality voice communication susceptible to atmospheric interference and language barriers. Data link eliminates language barriers by providing standard, written communications and continuous position reports. With full implementation of data link mandated airspace, there will be a corridor in the same geographic area as the current Blue Spruce Routes, for aircraft not equipped with CPDLC ADS-C. Aircraft using this corridor will, however, require ADS-B. The FAA has extensive plans to implement CPDLC DCL capabilities in the domestic U.S. airspace. The first of those capabilities has been fully deployed in the first 56 major airports in the U.S., where data link will be used for clearances over VDL Mode 2. December 31st, 2019 ADS-B will be required in most of U.S domestic airspace. The first phase of the mandate for data link services in the North Atlantic (NAT) region commenced in 2013. As of that date, all aircraft operating on or at any point along two specified tracks (FL360 to FL390) within the NAT OTS were required to be fitted with and using CPDLC and ADS-C. Phase 2A was expanded in 2015 to all OTS tracks (FL350-FL390) requiring CPDLC and ADS-C. Phase 2B implemented in 2017 requires CPDLC and ADS-C in the entire NAT region (FL350-FL390). Phase 2C commencing January of 2020 further expands CPDLC and ADS-C mandated airspace to include FL290 and above throughout the entire NAT region. December 31st, 2019 ADS-B required for U.S. domestic operations. The equipment that you need to meet these mandates is aircraft specific and depends on age, manufacturer and current avionics platform. It also depends on how you plan to utilize your aircraft i.e. domestic U.S. only or frequent trips to Europe. In either case, it is essential to plan, budget and schedule a maintenance slot well in advance. Basic ADS-B solutions that utilize existing equipment and require an updated transponder may be available for $100K and a few weeks downtime. 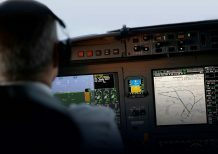 In contrast a completely new avionics suite such as the Rockwell Collins Pro Line 21 with FANS 1/A+ CPDLC may approach $1M in cost and require 12 weeks downtime. The clock is ticking…contact Bloom Business Jets today for specific questions regarding your aircraft. United States refers to this new system as FANS 1/A+ CPDLC DCL. + – Collectively today we refer to enhanced versions of the above technologies as FANS 1/A+. Data link Communications will utilize VDL Mode 2 to replace the antiquated ACARS system.